Hi all! I repared my Sims 3 and decided to make one work between new installed sims 3 and old sims 1. 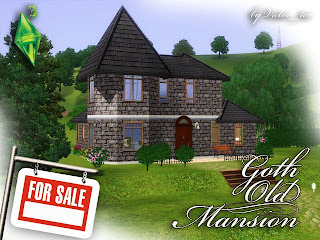 That`s a recover of Goth mansion from Sims 1. I hope you`ll like it. I didn`t use any Custom Content because my sims 3 game is just installed, but It will be much more in my next creation. More information in russian and screenshots are here. Just click the main screenshot and pictures under blue underlined title.